Sam Gichuru is the CEO of Nailab, a Nairobi Kenya based business incubator and startup accelerator that offers a 3 - 6 month entrepreneurship program with focus on growing innovative technology driven ideas. 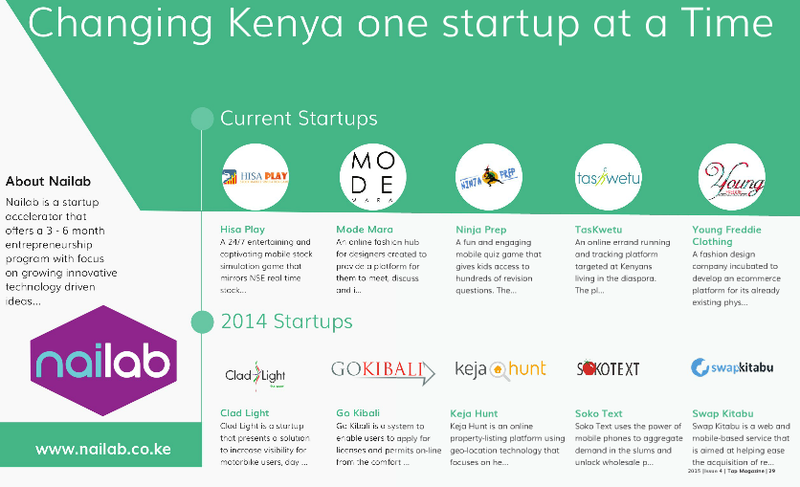 Startups like Hisa play and Keja hunt have all be featured at Nailab. Here's an interview we did with Sam in the backdrop of the Global Entrepreneurship Summit that was hosted in Kenya. The Interview was originally published in TAP MAG Issue 4. Kindly introduce yourself to the Tap Audience! Tell us more about your childhood- where did you grow up, who were your first heroes and what were your favourite moments growing up? How did you get into business? What else are you passionate about? Sam Gichuru: My greatest passion is seeing startups I have mentored excel and scale. I must admit I got into business by default. I had had a series of computer training and while I was working I felt the need to start something in Kenya we call “A side hustle” and I began offering software and other computer related services. As an organization our mission is to create an enabling environment that inspires and stimulates innovation and entrepreneurship. That is achieved through partnerships with different corporate entities that provide mentorships and other amenities that help entrepreneurs develop. Where has Nailab come from and where do you envision it in the future? Sam Gichuru: It’s been a journey of lessons for us as an incubator. From learning how to spot great solutions to developing a curriculum that works. By and large, nailab is still learning and fashioning the program to offer entrepreneurs a tailor made program. However as time goes, we have seen the need for a lot more early stage investors as a lot of the businesses at this level shrivel and die due to lack of funds. Sam Gichuru: Our greatest achievement definitely is seeing startups develop and grow their customer base. However just recently we had one of our first batch of startups acquired for over $1.5m. That in 3 years is a great achievement in this market. We also have had one of our startups join 100startups, an accelerator in Silicon Valley growing their valuation to over $100,000. From a policy level we are privileged to have spear headed, together with other ecosystem players, the establishment of Enterprise Kenya and entity that will see growth in trade of local ICT solutions across borders. Sam Gichuru: However just recently we had one of our first batch of startups acquired for over $1.5m. That in 3 years is a great achievement in this market. How is NaiLab different from other local incubators/accelerators? Sam Gichuru: As an incubator we play in the riskiest level of growing businesses, the early/idea business stage. We are also very keen on more than just the “business” behind the solution; to us the right team is crucial for the success of a solution. What are the key criteria’s you look for when choosing which startups to work with? What happens after the 6 months of incubation? Do you continue to consult these Startup’s or they are now on their own? Who are some of your most proud NaiLab Alumni’s? Does NaiLab have an alumni association? Approximately how many people do these companies employ? Sam Gichuru: We are proud of all our alumni’s for the achievements made. Its definitely not easy establishing a business and keeping it running with low capital injections. That said, our alumni have cumulatively created over 200 job opportunities. Who are some of your biggest partners? Is your preferred partnership financial based or you’re also seeking service to service partners? Will NaiLab be working hand in hand with the government in the future? In your opinion, should the Uwezo fund be implemented through incubation (or incubators) rather than the current vetting that the government does? The sixth global entrepreneurship summit is being held in Kenya this year! How do you assess the current local entrepreneurship ecosystem? What are some of the opportunities available and what are challenges that local budding entrepreneurs have to face? With the GES summit being hosted in Kenya, it clearly shows that Kenya has become a centre for innovation and entrepreneurship. There is definitely a booming startup environment that is heavily tapping to the untapped market and growing middle class. The summit offers a great opportunity to expose local innovators to the world and showcase the achievements the ecosystem has made over the last 5 years. It will also help inform both local and international investors on the areas to look out for. At the moment, there is an influx of investment in education. However, there is a great opportunity to grow solutions around security, agriculture and health. I gather that international investors are more interested in local entrepreneurs than local investors! Is this true? If yes, why is this so? How can we get local investors more involved? Sam Gichuru: Most foreign investors have had experience in IT. Locally the investors have more of a traditional outlook focusing on Real Estate and the capital markets. There is however a growing interest with the growing and delivery of tech startups. A lot more can be done and as Nailab we continue to engage interested local investors. What would you say Kenya is doing well that other African countries can learn from? What’s the most rewarding and challenging aspect of what you do? The growth and success of startups gives me great pride and fulfillment. As for challenges, they cannot all be summarized in one statement but the greatest one of all is time.